Our week in Colorado has concluded and we’re solidly back in reality, but now it’s time to share some of our favorite experiences from the Mile High City and surroundings. Our goal is always to get a feel for the true essence of a place and I think we covered a good amount of territory in our alotted time. 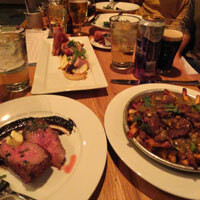 Euclid Hall Steak and Poutine. First things first: you have to eat, and Denver didn’t disappoint. While neighborhoods can be a bit spread out, there are some nice clusters of hot spots around the city. The areas we were most drawn to for dining and drinking ambiance were Uptown, Highlands and Baker. We decided our favorite overall meal was dinner at Root Down, in the Highlands neighborhood, but also give special mention to Olivéa, Euclid Hall, Axios and Beatrice & Woodsley. For brunch our favorites were Snooze, Dozens and Lucile’s. We also had a couple quick and reasonably priced lunches at Devil’s Food and Phat Thai. Great Divide Samples are a great deal at $1 each. On the drinking side of things, Colorado is well known for their beer, and many breweries will show you around, but we selected Great Divide Brewing for our touring purposes. Tours are available every day in the afternoon (check website for schedule), they are free and no reservations are required. 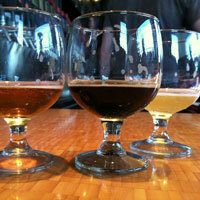 Show up plenty of time before the tour and sample some beers for a buck each, or grab a pint for $4. The tour is a pretty laid back affair, but you may or may not remember the details anyway if you have enough samples, they make some pretty potent brews. The Denver Zoo in City Park is a large facility with an impressive variety of animals and habitats. The recently added elephant exhibit is very cool. Dolly the elephant gives demonstrations with her caretakers in the afternoon. The zoo might have been more enjoyable in warmer weather for both us and the animals, but it was worthwhile. The Denver Art Museum is just off the south side of the Civic Center. The 2006 addition by Daniel Libeskind is the most iconic portion, with its jagged, mountain-like outline hanging over 13th Avenue. The random shapes of the building create unique (if slightly odd) galleries for viewing art. The museum is well-know for its collections of American Indian and Western American art. It’s a nice sized museum, big enough to have a little of everything, but not so overwhelming that you’re lost in there for a whole day. There are also lots of little reading and sitting nooks tucked throughout the galleries, a nice touch. 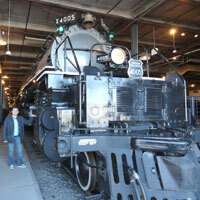 Big Boy Locomotive at the Forney Transportation Museum. 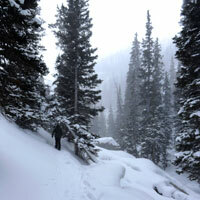 A major highlight of the week was snowshoeing in Rocky Mountain National Park. Just a 90 minute drive from central Denver, the tenth national park (1915) covers 415 square miles and contains 359 miles of trails, 150 lakes and 450 miles of streams. There are 72 mountain peaks higher than 12,000 feet within the boundaries! Activities are available in all seasons, but the park gets very crowded from June through August, so we found the frigid winter to be the perfect time to visit. For $5 a day, we rented snowshoes from Estes Park Mountain Shop in town and then got some hiking recommendations from Ranger Bill at the Beaver Meadows Visitors Center. Our trek started at the Bear Lake parking area and took us from 9,475 feet in elevation to 10,080, crossing (frozen) Nymph Lake, Dream Lake and ending at Emerald Lake. The wind chills were bitter cold in places, so most hikers turned back at Dream Lake, leaving the trail empty for us to discover Emerald Lake in complete solitude. For shorter trips outside the urban area, try Denver’s Mountain Park System. In the foothills and mountains to the west and south, the city owns more than 14,000 acres of parkland and wildlife habitat it preserves for enjoyment by residents and visitors. We took the short drive to Lookout Mountain Park, just west of town to do a short hike, see the Buffalo Bill museum and gravesite and make a quick stop in the historic town of Golden. 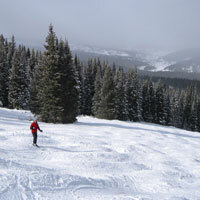 Copper Mountain’s uncrowded slopes after the New Year holiday. Of course, no winter trip to the Centennial State would be complete without some slope time. We selected Copper Mountain based on friend recommendations and current snow conditions from iSnowReport. Waiting until after the busy holiday week meant there were no lift lines and uncrowded slopes. A friend gave us local coupons for lift tickets and equipment rentals that saved us over $100, so always check with locals on how to get good ski deals. So there’s a brief overview of our week in Denver. There are of course many more rewarding things to see and do, but this should provide a good starting point. We’ll be back. This entry was posted in Destinations, Travel Tips and tagged Chicago Denver road trip, Copper Mountain, Denver Art Museum, Denver Restaurant Recommendations, Denver Zoo, Great Divide Brewing, Rocky Mountain National Park, Rocky Mountain snowshoeing. Bookmark the permalink.